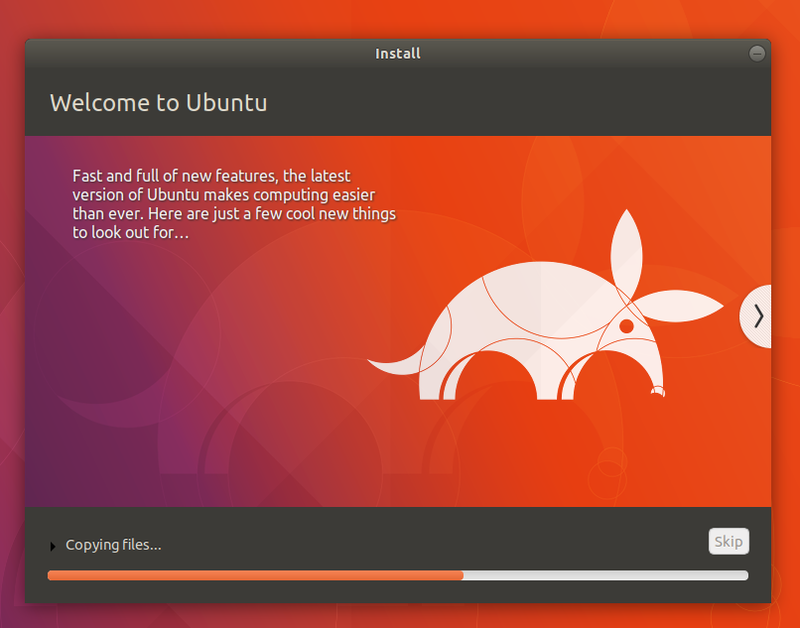 This is a step-by-step tutorial to install Ubuntu 17.10 "Artful Aardvark". You can read this to install in single-boot or dual-boot mode. 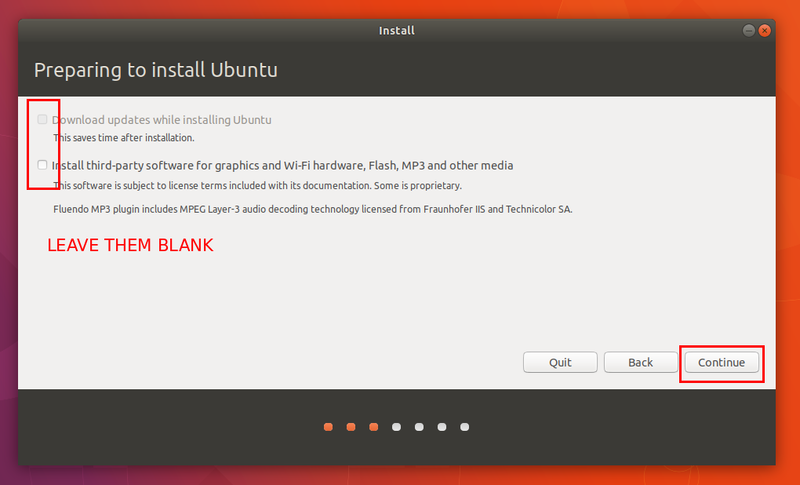 You will prepare 2 blank partitions first, then making a bootable USB drive, then installing Ubuntu in 10 steps. Make sure you did a proper data backup before and never lost focus when installing. Have nice experiences with Ubuntu! 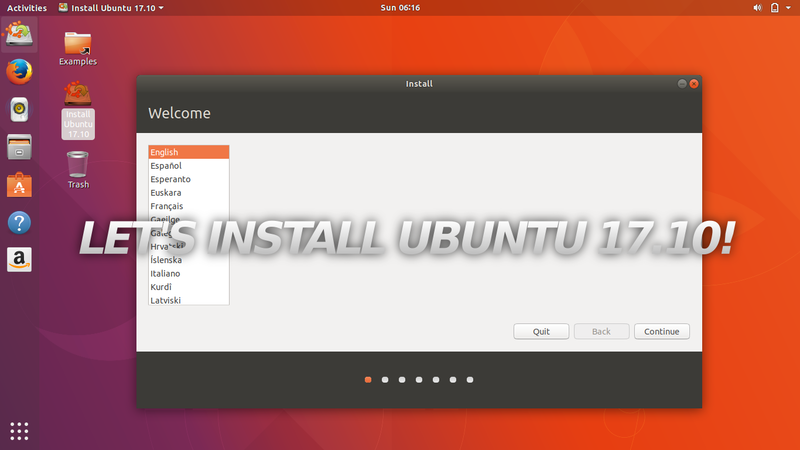 This article is an OS installation howto. For another article about Ubuntu 17.10, read Complete Download Links or Newbie's Guide. Two blank partitions, one >20GB and one ±1GB. Minimum Intel Celeron processor and 2GB of RAM. A USB flash disk >= 4GB as installation media, or, a DVD instead. IMPORTANT: INSTALLING A COMPUTER OPERATING SYSTEM IS NOT A NEWBIE JOB. IF YOU'RE A BEGINNER, ASK AN EXPERT USER NEAR YOU TO GUIDE YOU DIRECTLY, IN FRONT OF YOUR COMPUTER. MAKE BACKUP OF ALL YOUR SENSITIVE DATA BEFORE INSTALLING. Create a first partition of 20GB or more. Create a second partition of 1GB or more. Read more about swap here. You will install your bootloader to your hard disk. 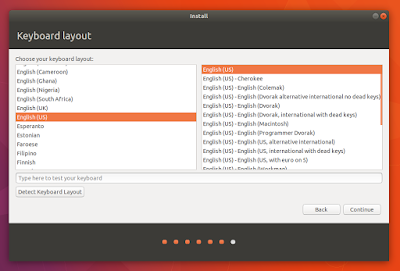 Write your ISO image of Ubuntu into USB flash disk with ISO writer program. Use Unetbootin program in GNU/Linux or Windows. Unetbootin won't delete files in your flash disk. Example: I created first partition /dev/sda6 40GB and second partition /dev/sda3 2.5GB so I will install bootloader to /dev/sda (notice sda is the parent of sda6 and sda7). Plug the USB drive into your computer. Reboot it and enter your BIOS. Set the first boot media to USB. 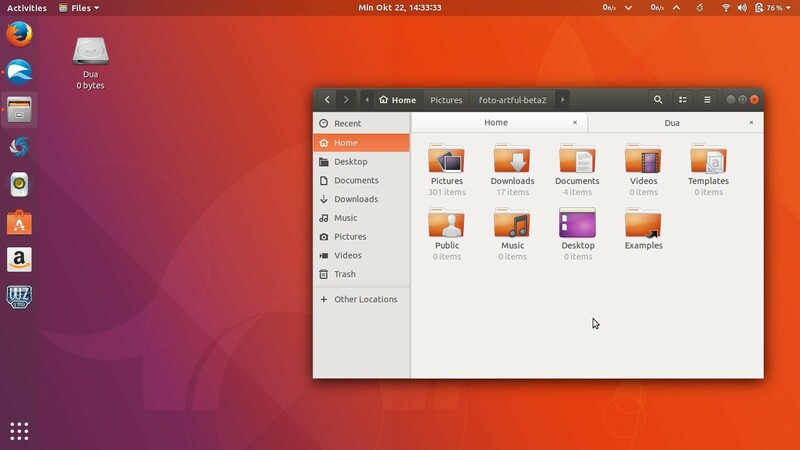 Now you should see Ubuntu screen in purple color and finally enter the desktop with orange color. 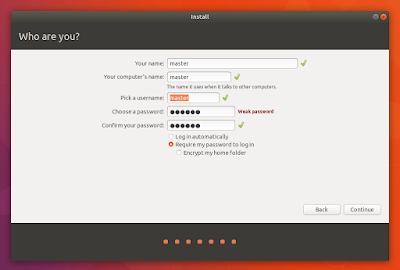 Choose "Try Ubuntu" instead of Install Ubuntu. Double-click the icon "Install Ubuntu" on desktop area. Select your language. This will be the language of all desktop and applications. Select no connection. This way installation will finish faster. Select no update. Again, this way installation will finish faster. Select "Something Else". This way you have full control in manual partitioning. 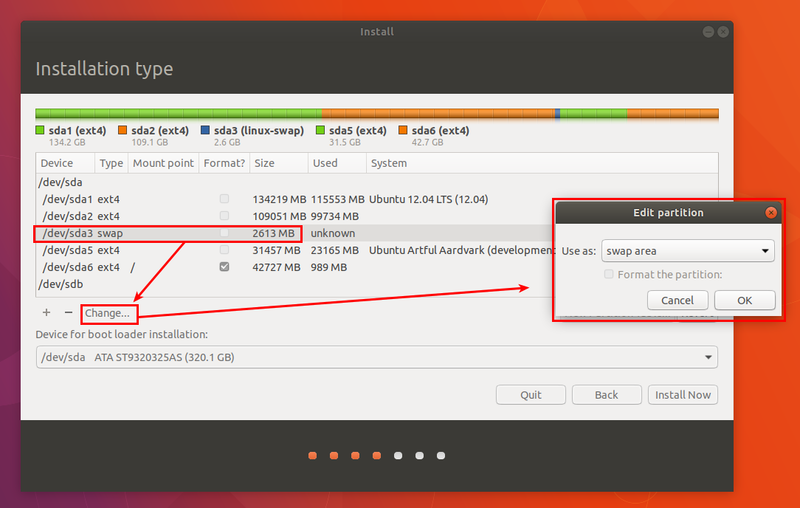 Don't choose the automatic choices like 'install alongside' or 'erase disk' (unless you fully understand what are you doing). 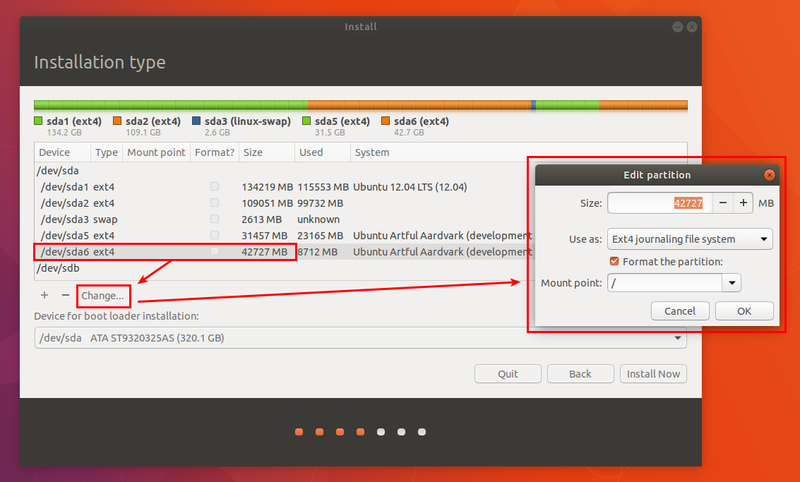 Create main partition: select the first blank partition (the bigger one) > press Change > make it Ext4 filesystem > check Format > make Mount point as / > OK. See picture below. 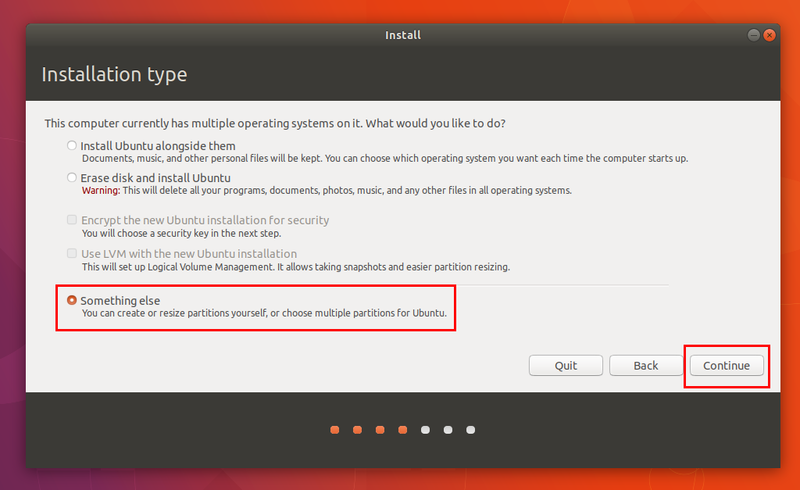 Create swap partition: select the second blank partition (the smaller one) > press Change > make it Ext4 filesystem > check Format > make Mount point as / > OK. See picture below. Select bootloader location: the correct location is /dev/sda if your main partition is /dev/sda6, or is /dev/sdb is your main partition is /dev/sdb6. The correct place is your hard disk drive which containing the partitions. 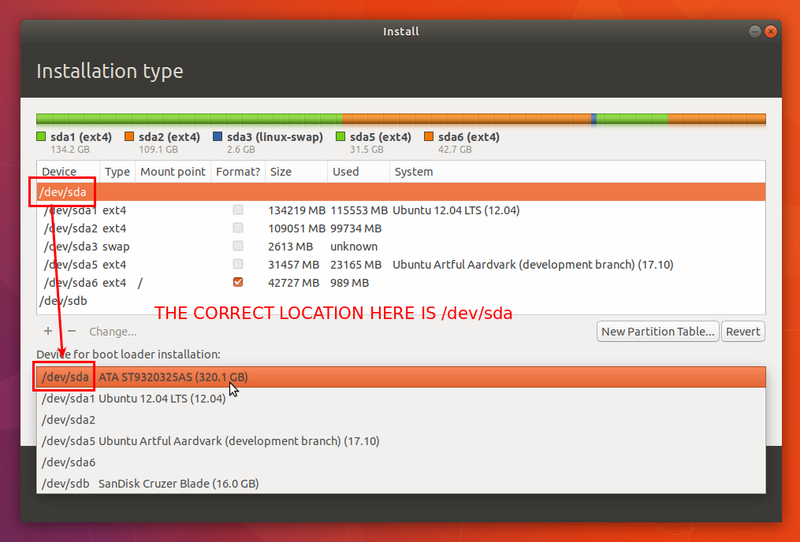 Here, for example, /dev/sda is hard disk and /dev/sda6 is partition inside it. 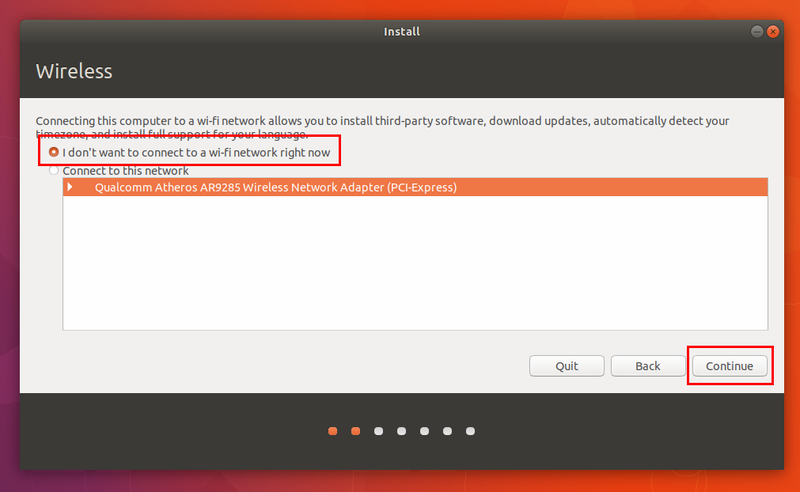 Start the installation by pressing Install. Now you just need to wait the installation progress to finish. 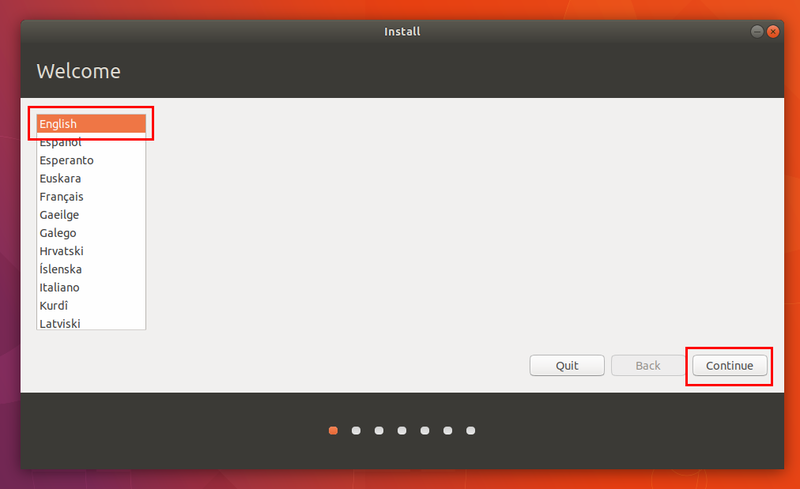 Once finished, Ubuntu will show you Installation Finished info. 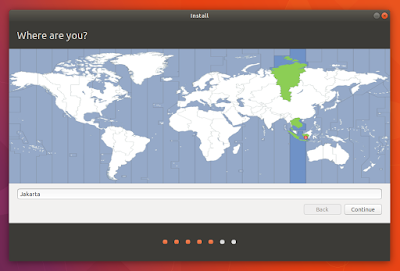 Now you can restart and enjoy Ubuntu! Once rebooted and logged in, you should see the nice desktop of Ubuntu 17.10. Happy working!